Simply, think of your face as a map and blemishes as X’s on that landscape. Spots in different zones correspond to different problems. 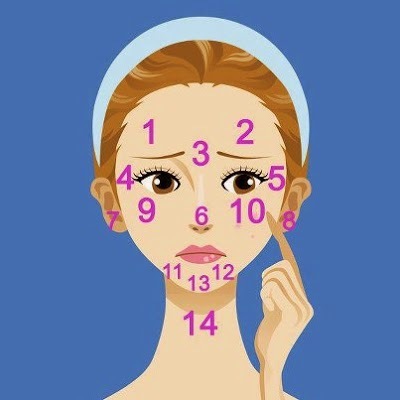 So, with this “map” as your guide, you can address the underlying causes of blemishes and not only make the unsightly zits vanish but also treat the underlying health problem in time. So the next time you break out or notice dark under-eye circles, look to your face map: your skin is probably trying to communicate on behalf of the internal organs. However, do remember that, as with all medical issues, it is always best to see your doctor or dermatologist for a proper prognosis. This is just a general guide to head you off in the right investigative direction – just because you break out between the brows doesn't always mean you have a bad liver!